This book is great for preparing young children for their Doctor visits. If you have young ones, you know that there are many visits to the Pediatrician. I believe this book helped ease the fears of our girls when they had to go for their checkups, even when they knew they would receive shots. The book explains in basic terms all about the doctors and nurses. It explains why they look in your mouth and ears. It explains why they listen to your heart and push on your stomach. It explains the shots and much more. There is also a friendly little dog named Angus that is involved througout the book. He adds fun to the book. Kids really do learn from this book. You can start reading it to them when they are around 2 years of age. Find the best price for What to Expect When You Go to the Doctor. I'm not sure where my wife picked this book up at but it is pefect for introducing human anatomy to young children. It covers the whole body and does it in such a way so that pre-schoolers can follow along. Find the best price for Look Inside Your Body. My girls enjoy this book but I imagine boys would really go for this one. 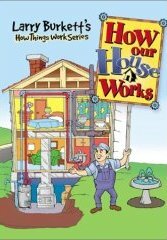 It explains everything about how a house works, from plumbing to electrical. The pictures in the book are very good with lots of details to point out. This one is probably a little deep for pre-schoolers but perfect from K on up. Find the best price for How our Hosue Works. Wow. What can I say here except this one is really, really, really a must have book for pre-school children. 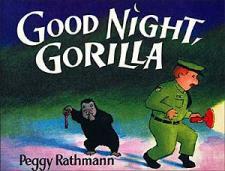 The book tells of a gorilla and his friend mouse sneaking the keys from the zoo keeper. They let all kinds of other animals out of the zoo as well and follow the zookeeper home without him knowing. They even go to sleep in his room but then his wife hears everyone say good night and wakes up to discover the crowd of friends. There is also a neat thing about this book. From page one, a helium baloon is let go. You can always find this balloon in the sky as the book progresses. Sometimes it is very small. The book will be loved by your children for quite some time. Our copy is wore out. Find the best price for Good Night Gorilla. I have only listed one of the Frog and Toad books that we have but any of these books are outstanding for teaching your children to read. With these books around the house, your children will be reading on their own in no time. Frog and Toad are friends and have all sorts of wonderful adventures together. Children love them! Find the best price for Days with Frog and Toad. This book is similiar to Frog and Toad books. It is about a mouse reading a book who is caught by a rotten weasle. The weasle wants to make soup out of the mouse but the mouse tricks the weasle. Children will love the story. Find the best price for Mouse Soup. Parents love this book because the end result is a clean, organized room. 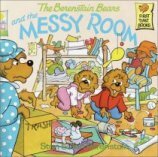 The book is quite good as Mamma Bear becomes upset with the cubs' messy room. Papa Bear has an idea to help organize and in the end, it all works out well. Find the best price for Messy Room. Most of the Berenstain Bears books are quite good. This one is no exception. Papa Bear wants to play a trick on the scouts so he dicides to dress up like a ghost and scare them in the woods. Little does he know that the scout leader is on to his plans and has a scare in for him. Not only that, Mamma Bear was on to his plans as well and she gives them all a scare that night. Children love these books, boys or girls. Find the best price for Ghost of the Forest. This one teaches us a good lesson, to remember what thanksgiving is all about. Papa Bear gets so wrapped up in the pumpkin contest that he will do anything to win. He even takes the cubs with him one night to sneak in to Farmer Ben's pumpkin patch to spy out the competition. They end up getting run out by a pitch-fork! In the end Papa Bear places 3rd in the contest but the family is thankful. find the best price for the Prize Pumpkin.